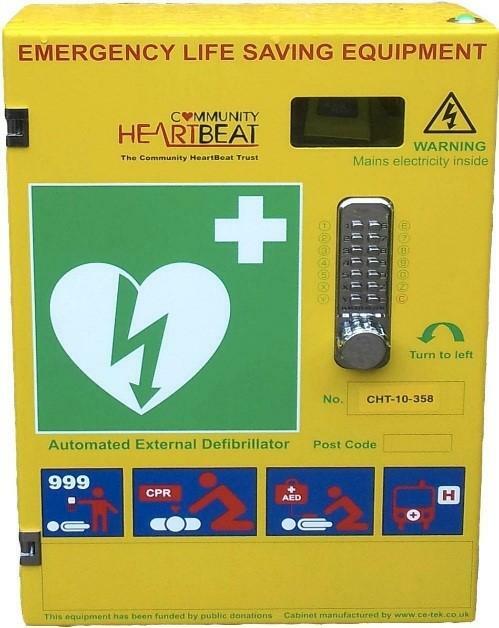 Thanks to a Rotary Foundation Global Grant (£27,700) District 1260 is able to provide 15 defibrillators and Stainless Steel Cabinets, for installation within the District. The cost of installation is included and each community receiving a unit will benefit from a comprehensive awareness training session. The training sessions will not only explain how to use the defibrillator but also dispel some of the myths about their use. Cardio Pulmonary Resuscitation (CPR) training will be provided too. The defibrillators will be key-locked for security, with access given by Ambulance Services Control only on receipt of a 999 call. The project is supported by the national defibrillator charity Community Heartbeat Trust, (CHT). Their strength is governance and making sure the project is done properly. They have recently been accepted by RIBI as a company with which it is safe to do business. More will be heard about that at the forthcoming Regional Assemblies. Bedford Castle Rotary Club - Wixams Village Community Hall. More details for the Clubs involved will be published shortly but we trust as many Clubs as possible l become involved, especially when a training seminar is in the area.